Relics of the Race for Space. a collection of gadgets that cosmonauts – and pioneering space dogs – need to live in space, including a shower, toilet, medical instruments and survival kits for crash landings. Explore the historical, cultural and spiritual context of Russian space travel, shaped especially by the turbulent early decades of the twentieth century. See poignant testimonies and memorabilia belonging to some of the biggest names in spaceflight and discover the deeply personal stories of the pioneers who kick-started the space age. It’s a marvellous exhibition, my only gripe being that photography isn’t allowed (oops). The chance to see real spacecraft, that have journeyed to, and from, space is a real thrill. Looking at Valentina Tereshkova’s Vostok 6 capsule sent shivers down my spine, it’s a tiny, primitive spacecraft, and looks so battered and scorched from its re-entry. I think my favourite exhibit was the unused LK-3 Lunar Lander, the Soviet counterpart to the Apollo program. It’s a beautiful, intricate, beast of a machine, like a huge steel cyclops. 13 days before the launch of Apollo 11, the N1 Rocket (designed to carry the LK-3 and Cosmonauts to the moon) suffered a catastrophic failure, destroying both the rocket, and the launch facilities. The program never recovered and was finally cancelled in 1974. It’s a shame the LK-3 never made it to the moon, it’s what it was born to do. I did manage to sneak a few pictures, and I grabbed a few souvenirs from the shop. I think my drawings might take on a distinctly Soviet and utilitarian appearance for a while now. LK-3 Lunar Lander. Designed and built for a journey to the moon that it never made. Soyuz Capsule. Currently the only way for astronauts and cosmonauts to make the journey to and from the International Space Station. I love the artwork from this period. The posters were terrific. Such a bold and direct style! Absolutely. To be honest the exhibition could have done with a few more of them! I went to this last week. It was excellent. Really well put together. I loved the bashed up capsules. And the monkey space suit is worth the ticket price alone. 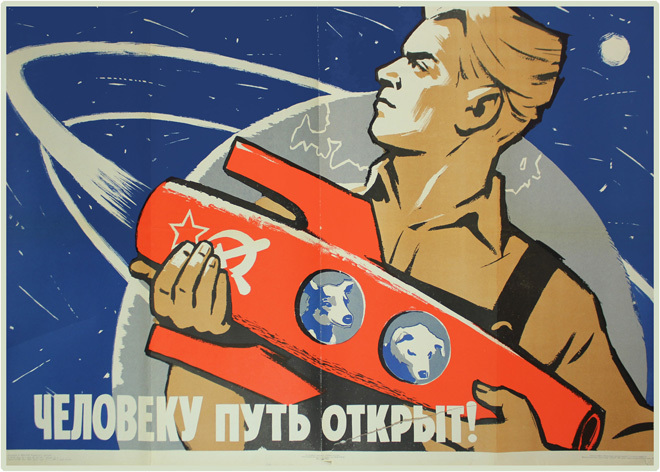 For me, the utilitarian Soviet-designed spacecraft knock US spacecraft into a cocked fur hat. Where the show is was let down a little bit is a lack of social context. What was the daily reality of life in those times as a Soviet citizen? What did the space race mean for the average Joe (Stalin)? What were the sacrifices made to keep ahead of the US?